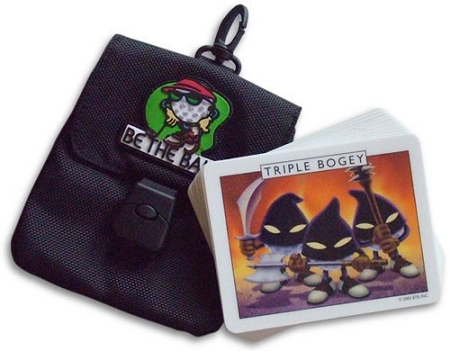 A set of 12 high quality, durable plastic cards makes up the game. Each card depicts a Hazard or a Reward that you will encounter during your round. When a player hits the shot depicted on the Card - they have earned the card. That player holds the card until another player hits the shot that will earn the card - at that time you "Pass the Card". At the end of the round - tally up the cards. If you're holding a Hazard Card - pay everyone in the group. If you're holding a Reward Card - Everyone in the group pays you. You set the Value $$ of the cards.